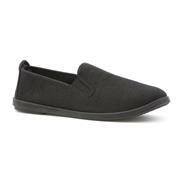 Slip on canvas shoes are a design classic that’s been around in one form or another for years. They’re popular for good reason: they look fantastic, they’re comfortable, and they’re versatile enough to match with just about every outfit in your wardrobe. 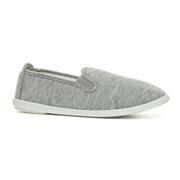 Whether womens slip on canvas shoes are paired with leggings, jeans, skirts or dresses, they’re sure to look bang on-trend. 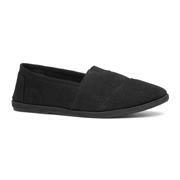 Here you’ll find women’s canvas slip-ons in a myriad of styles and colours. If you’re looking for something timeless, then navy-blue and white stripes are sure to look the part both on the beach and on deck. If you’d prefer something a little brighter, then why not go for our studded white canvas slip on shoes from Lilley’s Women’s range? Or maybe you’re after something that will draw attention, in which case a pair of floral pumps will make a fantastic part of your summer wardrobe. What better companions for the summer could there be? 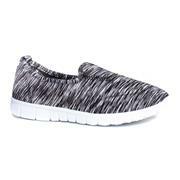 As with all the footwear you’ll find on the Shoe Zone website, these slip-on canvas shoes are available at affordable prices, but they don’t compromise on quality. What’s more, you’ll benefit from free standard delivery on all of them! 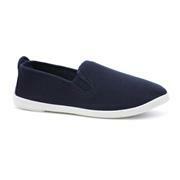 29 products from £4.99 to £44.99.